With sports and their stars earning unprecedented sums to wow us with amazing on-field performances, the big question nowadays is how to translate that excitement into other forms of entertainment and media. The games we watch are already television’s biggest hitter. NBC’s regular season telecasts of the NFL’s “Sunday Night Football” delivered higher ratings than almost any other broadcast series last season, and ESPN’s “Monday Night Football” performed similarly on cable. In June, NBC retained the rights to four future Olympics Games for a staggering $4.38 billion. Building on that success, Jeff Jenkins, who is the exec producer of “Khloe & Lamar,” which focuses on the marriage of Khloe Kardashian and Los Angeles Lakers forward Lamar Odom, believes the reality genre is poised for increased athlete involvement. “I think this is only the beginning,” he says, adding that “Khloe & Lamar” proves “it is safe to come play in the reality television world because it can add to what you’re doing. Indeed, along with Odom’s series, ABC’s popular “Dancing With the Stars” has been a strong vehicle for numerous sports personalities with athletes winning six of the season’s 12 contests. On HBO, the documentary skein “Hard Knocks” has helped elevate the personas of those in the sporting world, such as New York Jets coach Rex Ryan. Nevertheless, Wasserman Media Group chairman Casey Wasserman, whose conglom represents numerous top players from professional leagues, isn’t convinced that players in front of the camera are going to prove the type of boon that Jenkins suggests. “There is no question that athletes continue to move up the value chain in the world of media, but as valuable as sports are, you’d be hard pressed to find more than a small handful of (entertainment) projects that can be built on the backs of the athletes,” Wasserman says. Wasserman says sports are such a ratings winner because they are the ultimate reality television. 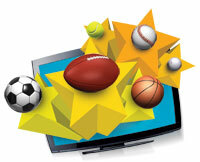 As a result, centering other entertainment programming on sports would feel relatively flat. At the same time, Wasserman sees the uptick in player stature as an opening for another area: social media and e-commerce. Because players have been savvy with their use of online tools such as Twitter and have built-in local audiences, they are very well-placed to leverage those networks. Taking a broader look at this question, Peter Guber, Mandalay Entertainment CEO and co-exec chairman of the NBA’s Golden State Warriors, suggests the answer is more holistic. It requires looking broadly at why sports succeed and then adapting those practices elsewhere in the entertainment world. For example, Guber believes areas where sports get it right, like delivering information to fans quickly or emphasizing crowd participation at games, should be considered in other entertainment ventures and tailored to that experience.